On most Friday nights in Accra, the streets of the restaurant-lined district of Osu are bumping loud music, and open-air bars are spilling over onto the streets. It was sometime in December after Ghanaian fashion brand, Charlotte Privé’s holiday show when I was standing in line for the bathroom at Republic Bar. A woman standing next to me asked where I bought my pink and gold sheer top. When I replied that I got it from Pokua Poku in Osu, she was shocked to hear there were amazing shopping finds in town. Immediately, I launched into what I knew about the history of Ghanaian fashion traced to the importance of the traditional Kente and Ntuma (or cloth) textiles, and how it has evolved to become an international industry. She, like many others, assumed there would be a lack of available, quality consumer goods. You won’t find Zara and H&M at any of the shopping malls yet, but you will find exclusive boutiques that are upscale, ready-to-wear, and ethically made. Whether or not my bathroom buddy appreciated my advice, I make sure to impart to many visitors that stepping off the plane in Ghana is a chance to let go of Western dress codes finding relief from the African heat. However, if you’re coming for business or staying for holiday, do not feel tempted to don your tie-dye, Tevas, and harem pants when you go out in Accra. There is opportunity for backpacking and living from the land, yet nightlife in the capitol is like any other metropolis, and fashion in Ghana is a serious business. This article will enlighten those who have yet to discover these gems and, hopefully, inspire more suggestions. Many of the places listed are boutiques with ready-to-wear clothes, but if shopping at Makola market for fabrics and getting your clothes custom made is your calling, then read my article coming up on tailoring do’s and dont’s in Ghana. Last point is — don’t just stick to fashion. It would be an injustice not to support the interior design and raw material markets — because there is just so much good stuff. 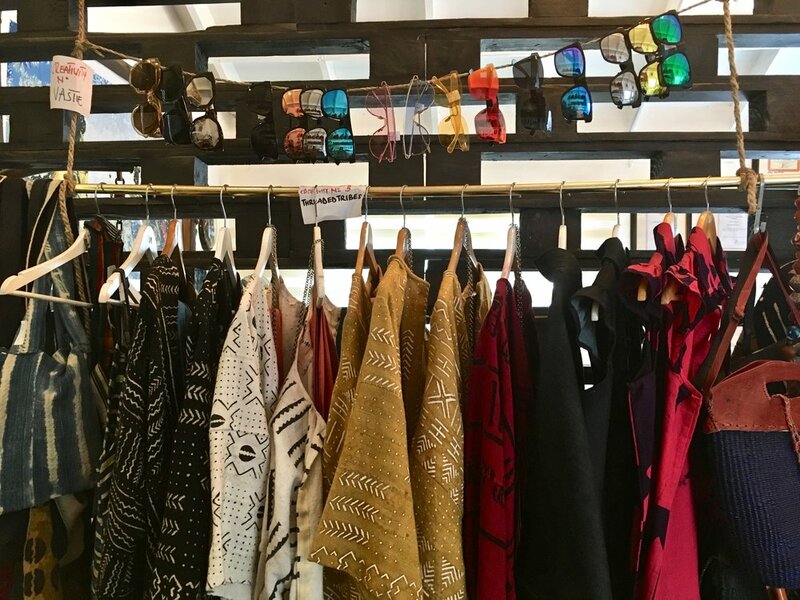 Next to the Accra stadium and close by to Independence Square, you will stumble upon El Lokko an Accra favorite for funky, high-end Ghanaian fashion. I bought some incredible pieces here from Osei Duro (Raffia shorts and hand-dyed blouses) and African print laptop cases made by Della. I can never stay away from the jewelry and bags collection — you won’t be able to either. In Nyaniba estates, an up and coming neighbourhood south of Danquah circle, there are quaint shops and restaurants intermixed along the streets. One of these is The Shop Accra. You’ll enter through the plant lined verandah and become immediately distracted by the color, texture, and patterns of the goods inside. The famous Bogolan mud relief textile on these living room chairs were my first obsession when I was there in August. From the entry space to the back room, you’ll feast on all cool-things-West-African, like furnishings for your house or apartment, gifts, clothes, and accessories. If you're looking for more fashion and creative, wearable variations of African print patterns, Afro Mod Trends and Christie Brown in Osu are the places to find it. I get compliments on the silk wrap dress and Kimono shift dress from Afro Mod wherever I go. The print is the traditional wax print designs transposed on silk cloth that is bright and elegant. I have often found great items from Charlotte Privé in Labone as well. Driving along the Labadi beach road, your attention will be drawn from the view of the Ghanaian coastline, to a giant, pink/maroon building facing the roadside known as Accra's Artists' Alliance. From inside, standing on the wide staircase, surrounded by 4 floors of art, you’ll look out the windows to the sea and feel a world away from the city heat. I would often wander in here for inspiration, to look at the artwork, browse the bookstore, and pick up too many decorative items for the house. 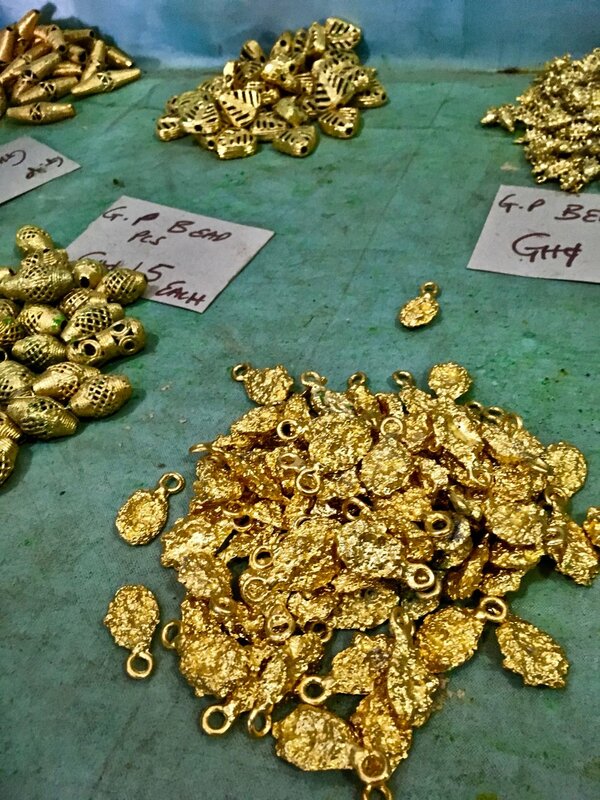 The below gold colored, brass beads are perfect for making jewelry or adorning yourself in what you would like to think is ancient Ashanti gold. 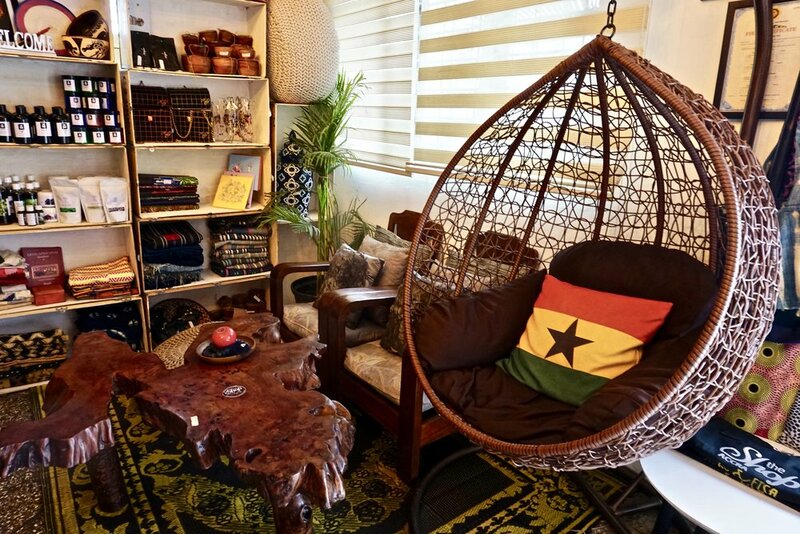 On the other side of town, near the Ghana University Legon campus, the large artisans collective and shop called Wild Gecko is a treasure trove of high-end Ghanaian and regional handcrafted furniture and interior décor. 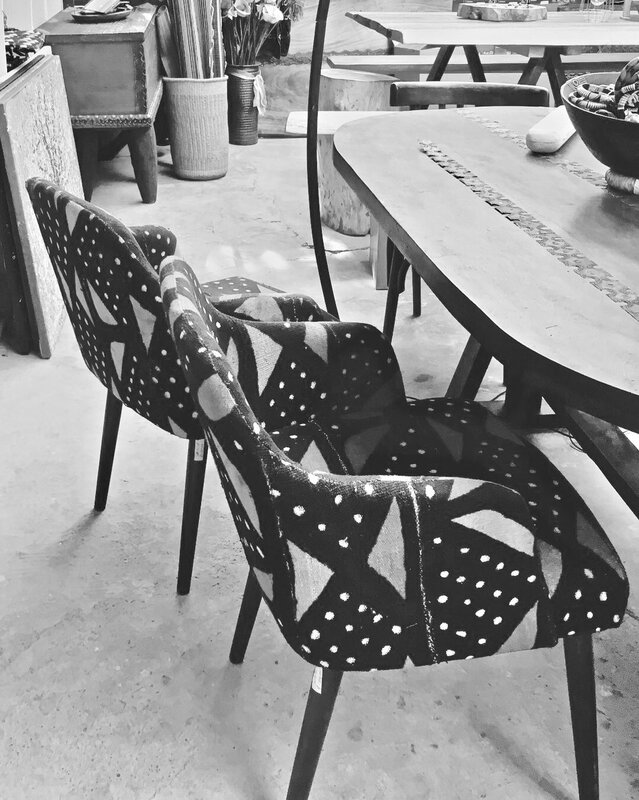 Larger items like tables, chairs, and armoires are made from locally sourced wood and designed by Ghanaian artisans. The shop also features beautiful jewelry, accessories, and clothes sourced from throughout the continent. Wild Gecko was my go-to for Christmas shopping year after year. However, the basket stand on Togo embassy roundabout is the best place to buy Bolgatanga baskets, and Mr. Prosper will give you a good price. Finally, your shopping spree would not be complete without picking up some of Ghana's hottest and best quality raw material products — coffee, shea butter, chocolate, Baobab and Moringa powder — from companies who not only produce and manufacture in Ghana, but also create much needed jobs and economic growth. For centuries these products have been exported in their raw form to Western markets. But now, the best of these Ghanaian owned companies are bringing the demand and supply chain home: Jamestown Coffee Roasters craft-roasted coffee beans from Volta region supplying coffee shops, grocery stores, and hotels in Accra. True Moringa tea and Moringa products, Kaeme whipped shea butter, Tama and Peini body products, and Niche chocolate in dark, milk, ginger, and coconut flavors. It’s hot as hell in GH, but enjoy the heat, drink a cocktail next to the pool at Villa Boutique, and daydream about what you’re going to wear or give to loved ones. And you don’t have to feel too guilty about the price tag knowing that all you spent goes back to supporting talented entrepreneurs, designers, and artists. After all, the disposable fashion industry is no longer à la mode, and what you just bought from Charlotte Privé or Afro Mod Trends is most likely one of kind. So don’t pack too much because shopping there will help you weave comfort with class. As you do good with your work when you’re living in or visiting Ghana, remember to buy Ghana-made and do good with your wallet too! Do you know other great places to shop in Ghana or West Africa? Divulge your go-to spots so your favorite enterprises can benefit.